That’s my mantra when it comes to fashion, architecture, art, and often, even cooking. And that’s exactly what this dish is all about. 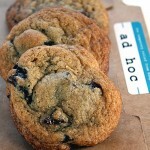 If you’ve been following FoodGal over the past couple of weeks, you know I’ve been cooking my way through the small promotional brochure I got in the mail for the upcoming “Ad Hoc at Home” (Artisan) by Thomas Keller. Unlike the other cookbooks by this esteemed chef, this one promises to be much more accessible to the home cook, being that it’s based on dishes cooked at his most casual of restaurants. What a tease this is. The brochure only includes four recipes as a sneak preview of the actual book, which won’t be published until November. If early results are any indication, this book looks to be a classic that we’ll all be reaching for time and time again. Keller starts with enormous scallops — graded U7, meaning seven make up one pound. At my local seafood store, I couldn’t find U7. So I settled for “U Be As Big As They Get” — about 11 to one pound. Keller actually brines the scallops before cooking, too. I’ve brined my share of turkeys, chickens, and pig parts. But never scallops. He explains that he does this to season them all the way through. And what an amazing technique this is. The scallops rest in the brine for only 10 minutes, then are rinsed, dried, and refrigerated for 1 1/2 to 3 hours. Clarified butter is heated in a stainless steel frying pan. You add only enough scallops that will fit comfortably without any overcrowding. You leave them be for about 3 minutes, allowing the undersides to get deep golden brown. Then, you flip them over, and cook until the other side is caramelized. Keller calls for sprinkling the scallops lightly with salt before cooking, but I didn’t think they needed any extra after brining. Once the scallops are cooked, just squeeze a little fresh lemon juice on before serving. No further embellishment is needed. The recipe says it serves six. With my smaller scallops, I found that my 1 3/4 pounds served more like two. If you’re not as piggish as Meat Boy and I, though, it could probably serve four. I’ve cooked many scallops before, with simply olive oil or with more complicated sauces. But none have had the deep flavor that these do. They are crispy on the outside, and silky tender inside. They are buttery, sweet, and briny with every single bite. These scallops are the epitome of that, through and through. Line a small baking sheet with paper towels. Combine the 2 cups salt with hot water in a large bowl, stirring to dissolve the salt. Add the cold water. Add scallops to the brine and let stand for 10 minutes. Drain the scallops, rinse under cold water, and arrange in a single layer on the baking sheet. Cover with more paper towels and refrigerate for 1 1/2 to 3 hours (no longer, or the quality of the scallops will be affected). Heat a generous film of clarified butter in a large stainless steel frying pan over medium-high heat until it ripples and begins to smoke. (Although you may be tempted to use a nonstick pan, a stainless steel pan will produce a more beautiful caramelized exterior.) Sprinkle scallops lightly with salt and add them to the pan, without crowding. (If necessary, cook scallops in two pans or in 2 batches; if they touch, they will steam rather than caramelize.) Cook, without moving the scallops, until bottoms are a rich golden brown, 3 to 3 1/2 minutes. Turn scallops and caramelize the second side. 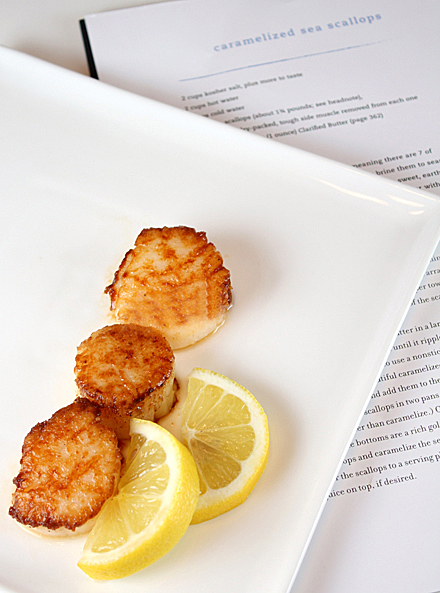 Transfer scallops to a serving platter and serve with a squeeze of lemon juice on top, if desired. Tip: Thomas Keller writes that the best way to sear a piece of fish or meat is over high heat. After you put the fish or meat into the pan, don’t try to move it — let it cook until the bottom browns and releases on its own. When it is ready to turn over, turn it, and if possible, put it in a different part of the pan. The surface there will be hotter and give the best sear to the second side. I would have never thought to brine scallops beforehand. Those look delicious! Well, thank you (I hope) for solving my question, what’s for dinner! The hope is that I can find some scallops worthy of this lovely recipe. I love scallops and I agree the simpler the bigger. I probably have to go shopping for “U Be as Big as They Get” scallops too because I’ve never seen U7 scallops at my store. Oooo I’ve never tried brining them. I’m definitely going to have to give that a try. I also love making pan sauces with the fond that forms after searing scallops, a little lemon juice, and butter whisked in is all it takes. I think you should change your name from Food Gal to Photo Gal. That first photo is astonishingly beautiful. Those look divine. I may have to stop everything and cook my way through this book when it’s released. I’m drooling here…. 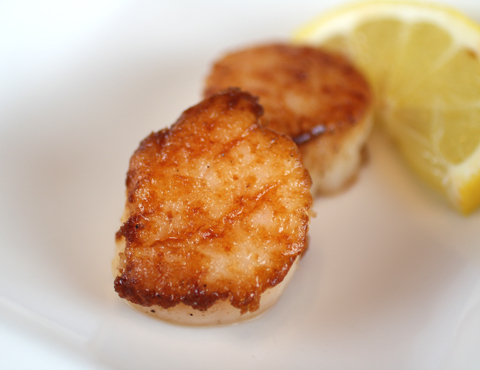 clarified butter is the key to developing a nice caramelized scallop without burning it! Marc: I’m with you. I love making pan sauces like that with lemon juice, butter, and sometimes a little wine. Jaden: Hah! Glad that Meat Boy and I are not the only ones out there with the rather healthy appetites. These look perfect. I’ve asked for the Bouchon cookbook for my birthday! I love that restaurant. Oh wow, those look so beautiful! Too bad we just had scallops last night already. Will have to try this recipe the next time. I’ve been too chicken to try cooking them in a a stainless steel pan before. I don’t have any clarified butter, but do have a jar of ghee. It’s a kind of clarified butter, isn’t it? Think it might just taste a little nuttier? Your pictures have sold me. I’m putting his Ad Hoc cookbook on my Christmas list this year! Suzy: Ghee will work just fine. Probably even better, as it’s clarified butter that’s been cooked down a little longer to give it a slightly nutty flavor. Enjoy the dish. The brining technique really does make the scallops taste quite amazing. 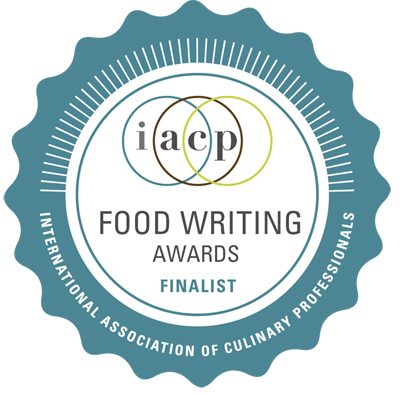 These sound impossibly delicious – still a lot of effort, considering it’s more geared towards the home cook – but you described them so beautifully I think it’d be worth it. And the colour of those scallops is to die for! 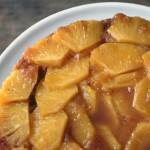 the caramelized crust looks delicious! I love the huge scallops, didn’t know they have official designations like that. Yummy! Haven’t had scallops since, oh, January, I think. I made these tonight, with some adaptations that didn’t work out so well. I used frozen Costco scallops. I don’t think that was a bad choice, as their scallops are very good quality and never chemically treated. Because they were frozen, I brined and thawed at the same time and extended the time to 15 minutes, followed by a rinse. I hurried the cooling — 20 minutes in the freezer rather than 1-1/2 hours in the fridge. Much to my surprise, they were very salty! Other than that, they were quite good. I flipped the early, because they were browning quickly but now think I should have gone the full 3 to 3-12 minutes, as the crust, while nicely caremelized, had no crispness. So my verdict, for what it’s worth, is that I should have followed the recipe more closely! The results were nonetheless good enough that I will give it another try. Moe, I’ve got a bag of Costco frozen scallops that I will probably use in this recipe. Can you tell me what brand of Kosher salt you used? I will adjust accordingly as I have Morton’s. Thanks. The chart below shows equivalent amounts of table salt and the two most popular brands of kosher salt. Moe: Oooh, I’m not sure the brining while frozen, then sticking them back in the freezer to chill technique was a good move. That might affect the texture. Also, how large were your scallops? I’m thinking if they are a lot smaller, the brine might end up making them pretty salty. It’s like how you can brine a huge Thanksgiving turkey overnight, but you wouldn’t want to brine a single turkey leg for that long. So if you’re trying this recipe with much smaller scallops, I’d either try cutting back on the brining time or easing up a bit on the amount of salt in the brine. Suzy: I used Diamond Kosher salt when I brined my scallops. And I did use two cups, as the recipe specified. While the resulting scallops tasted nicely seasoned to me, they didn’t taste overly salty. The freezer stay did not affect the texture because they did not come even close to freezing — just a nice chill. As for size, they were pretty nice — 10 per pound. I didn’t imagine a ten-minute brine could be effective so I went for 15 — maybe 20. The real answer is to be more careful next time, now that I know how readily they accept a brine. Much more so than chicken or pork or shrimp, it seems. I think it’s because scallops (especially frozen ones) are pretty porous. Suzy: I used Morton’s Kosher salt and reduced the volume a bit (because Morton’s weighs more than a similar volume of Diamond Crystal, and I assumed Keller’s recipe is for DC). Diamond Crystal is my usual brand, by the way. The ratios you give are exactly what I measured once upon a time. I also halved the brine (half the water, half the salt) because it’s much more water than you need. Anyway, based on my experience, I would use 3/4 cup Morton’s in 1 c hot plus 4 c cold water; and no more than ten minutes. These scallops look amazing! This is a perfect example of what I wish I could achieve but never have due to my timidity with high heat. Thank you for Keller’s tip: as you said, I’ve got to embrace the heat! Just tried this recipe. All I can say is wow. So much flavor. I had a difficult time dissolving 2 cups of salt in 2 cups of water. I reduced the salt, closer to a 1 1/4 cup. The flavor was perfect. Finished with Ile de re sea salt and a generous squeeze of lemon. Scrumptious and Beautiful! Sarah: Glad you liked the scallop recipe. It’s pretty amazing what brining can do to a scallop, huh? And who would have ever thunk to do that with scallops of all things? I bought some U10s (I think, but they were a decent size) from the store and tried it out. When TK means a light sprinkling of salt he means it. I over seasoned mine by a bit. I bet the part about brining for only 10 minutes is legit too. Next time I might try 7 or 8 mintues and then finish with a bit of fleur de sel after they are perfectly caramelized. I used grapeseed oil and the sear was still beautiful (could be the high smoke point of gs oil). Anyone know why the refrigeration step after the brine? Is this so that the scallops won’t overcook in the center? Lynn: My guess is that TK refrigerates the scallops after brining in order to dry them out a little. The drier the scallops are, the better a sear you can get on them. And after cooking, I find the scallops need very little extra salt sprinkled on them — if any. They’re tasty just as they are. I made these last night from the recipe in the book. It calls for only 1 cup of kosher salt. I wondered if that part has been editied since the original post. I only used 1/2 of mortons when I made mine. It still made them fantastic. Loyal Food Gal reader, Cindy (see comment above), was kind enough to write to tell me that the more recent editions of the “Ad Hoc at Home” cookbook have a correction to the scallops recipe. The new version calls for “1 cup kosher salt, plus more to taste,” rather than the “2 cups kosher salt, plus more to taste,” as stated in my first-edition copy. The new amount of salt is reflected in the recipe printed above. Enjoy! Oh my gravy! I have never cooked scallops, but have eaten them before. I am going to make this recipe for my first hand at cooking scallops. Thanks so much for posting this. 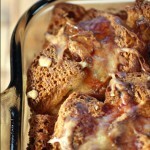 Great photos, great recipe but I wonder what Thomas Keller would think of you publishing his recipes. I hope you have his permission. This is a slippery slope called copyright. I’m just saying you should be careful! Sally: As a long-time newspaper journalist, I’ve always operated under the policy that reprinting a recipe is allowed as long as you credit the book, author and publisher. That’s what publicists have always told me to do in the past. And it’s what I’ve always done, whether I’m writing for my own blog or for a magazine or newspaper. In fact, the publicist for the “Ad Hoc at Home” cookbook personally thanked me at a book-signing event last year with Thomas Keller. She was grateful that I had helped publicize the book so much even before it was released. 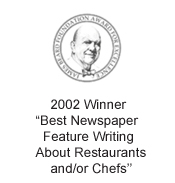 I’ve also known Thomas Keller and his public relations director for many years, as a result of my dealings with them as a food writer. Neither of them has ever asked me to take a recipe off my blog or complained about one being reprinted in a publication that I’ve written for. I work with many book publicists, who send me review copies regularly and even offer to send me images from the books if I need be. 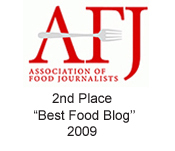 They’re always happy when I’ve cooked from a book and blogged about the recipe or interviewed the chef-author. So I hope all of this helps to put your mind at ease. I also firmly believe in getting great ingredients and then just getting out of the way. It was out of this world. Great blog by the way! Looking at his percentage of votes, america is still bottom heavy watching the rest of these “tv” stars that have no respect for cusine, but talk about going green, organic etc. The others are only looking for green to feed the bank. So glad to see you tried this! I’m cooking scallops tonight, and I have Keller’s book. I was reading his recipe, and wondering about it — it seems almost counter-intuitive. Although I’d never argue with Keller. So I’m definitely giving this a try — thanks. John: You will love the way these scallops cook up. I, too, thought it strange to brine them. But it really makes a difference. Enjoy! I’m a bit confused. After you make the salt solution, do you just pour it on the baking sheet? Hi Michelle: You mix the brine in a large bowl, then place the scallops into that same bowl. Then, you drain the scallops and arrange them on the baking sheet. I hope that helps clarify the directions. Happy cooking!